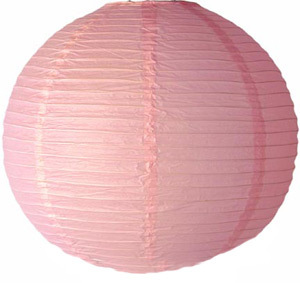 "Powder Pink Round Chinese Paper Lantern"
This is a trational pink color hanging Chinese paper lantern. We have this lantern in 8,12,16,18,24 and 30 inche sizes.It has even ribbing. This looks very nice when lit. This rice paper lanter has a metal expander that keeps it open. This lantern can be lit with one of our electric cords or hung with string from the ceiling. This lantern will look great at your next party or as a room accessory. This color is light pink like pink bubblegum.